Artist Jacquie Myrtle is celebrating 21 years of creating art on Anglesey and her involvement with the Ucheldre Centre, Holyhead, and the Anglesey Arts Forum. Jacquie was born in Holyhead, in the Empire Cinema which was run by her grand-parents for many years – a filmatic arrival rewarded with free cinema tickets till she was 15! She went to Art College in London to study fine art before family circumstances forced her return in the early 1980s. “After I had been back in Holyhead a while, I bumped into an old friend who said I must go up to the old convent as they were opening a community arts centre and it would be of interest to me. I began my involvement as their first artist in residence and working as an Art Club volunteer, working with sculptor Trefon Fôn Owen. Over the years I have held three solo exhibitions there,” says Jacquie. As an established watercolourist, acrylic and oil painter, her early involvement with the Art Club and workshops expanded her understanding of different materials and her love for mixed media. “I learnt loads about different media, including stone and papier-mâché. I also learnt how to manage large groups of children,” says Jacquie. Jacquie has run the Art Club at the Ucheldre Centre for many years and she runs community art workshops for Ynys Môn Mind and Digartref Ynys Môn. “"Someone at a workshop recently said ‘it’s amazing how many artistic people there are in Holyhead’. There are lots of creative people here on the Island. The Ucheldre Centre and Anglesey Arts Forum support us, and promote the arts on Anglesey",” says Jacquie. Being involved with the Ucheldre Centre, Jacquie was one of the first members of the Anglesey Arts Forum and has opened her doors every year for the Anglesey Arts Weeks over Easter. “I have been involved with the Anglesey Arts Forum since its beginning. world. It is also a great way to strike up friendships and collaborations with other artists. The bus tours this year were a great success. 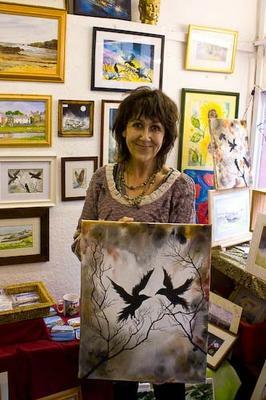 I hope the funding continues to support the Anglesey Arts Forum and the event grows every year,” says Jacquie. During the Anglesey Arts Weeks, Jacquie’s work was in the two Arts Forum exhibitions at the Ucheldre Centre and the David Hughes Centre, Beaumaris, and at her permanent shop space in Holyhead’s ‘Artspace’. New funding from project supporters has allowed the Anglesey Arts Forum to develop its website and include minibus tours during the event. The Arts Forum project has received funding through the Rural Development Plan for Wales 2007–-2013, which is funded by the Welsh Government and the European Agricultural Fund for Rural Development. “We hope the Anglesey Arts Forum, and the Ucheldre Centre, will be here for another 21 years. We are going to celebrate on Sunday, 28 October with tea and cake at the Ucheldre, and are holding a ‘21st Birthday Exhibition’, highlighting the work of artists over the years, including Jacquie’'s. Our celebrations coincide with the start of the Anglesey Performing Arts Weeks (19 October to 4 November) and the Holyhead Arts Festival,” says Mike Gould, the Ucheldre Centre General Manager and Chair of the voluntary Anglesey Arts Forum Committee. “Artists are drawn here because of the beauty of the landscape and seascape. "I am drawn to the emotions of the environment, and I am working from my emotional responses to create my new artwork which will be on show at Easter during the Anglesey Arts Weeks and at my ‘Artspace’ in Stanley Street, Holyhead",” says Jacquie. The Arts Forum exists to promote all forms of art on Anglesey and is hosting the Anglesey Performing Arts Weeks. If you wish to become a member of the Forum, please contact Heather on 01407 763361 or he(at)ucheldre(dot)org. Entries for the 2013 Open Studios are required by 30 November 2012. For more local articles and stories, see our free newsletter here. I have just checked some works of Jacquie Myrtle and it is really wonderful. She is really talented in oil painting and some of her creations seems like it is for real. I am much inspired by her life history. Jacquie has made a big contribution to artistic life on the island. Well done Jacquie!